Have you ever looked around your house and known you needed more space for entertainment and relaxation? 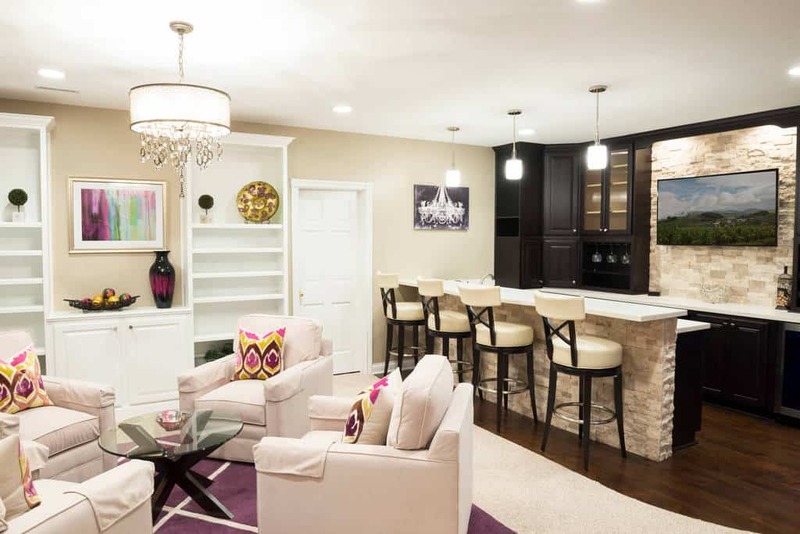 Maybe you like to host parties for family and friends and you just need more room to do it. If you have a basement that is sitting unused, save for storing some old boxes, then you already have the perfect space. 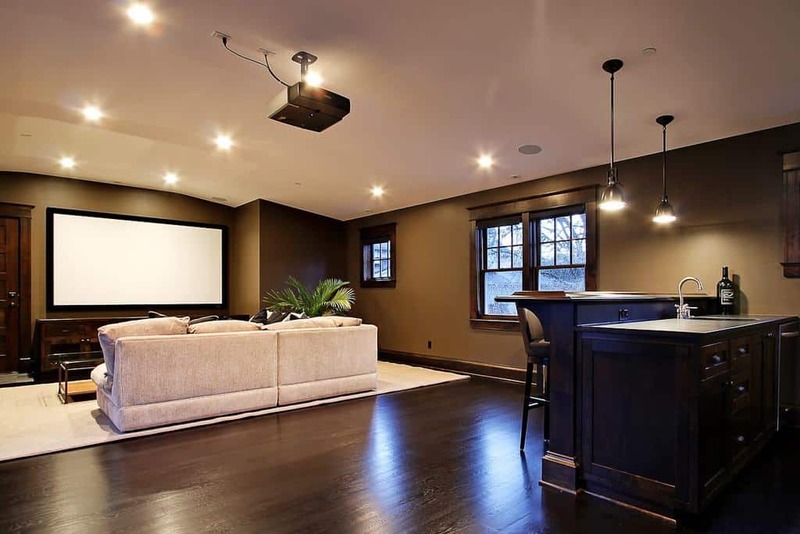 You can turn your basement into the perfect space for entertainment. 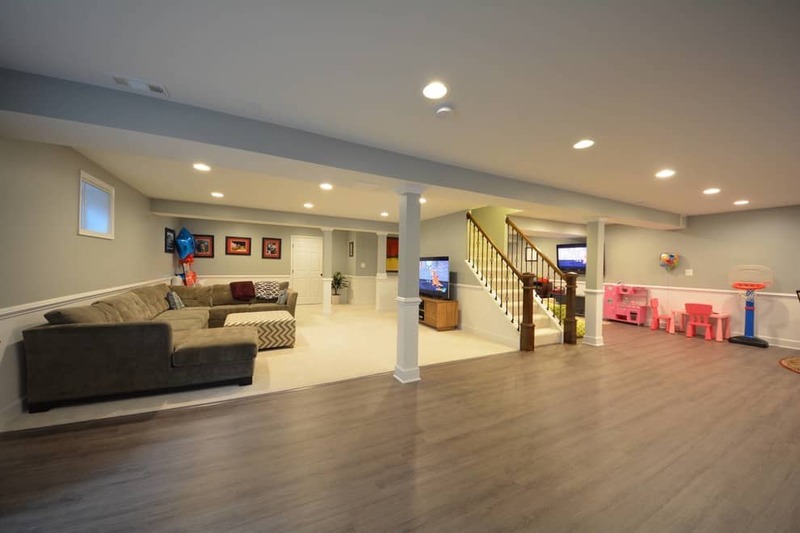 Whether you want to make a space devoted to movies or want to have somewhere you can escape to and read a book in peace, converting your basement is easier than you think. 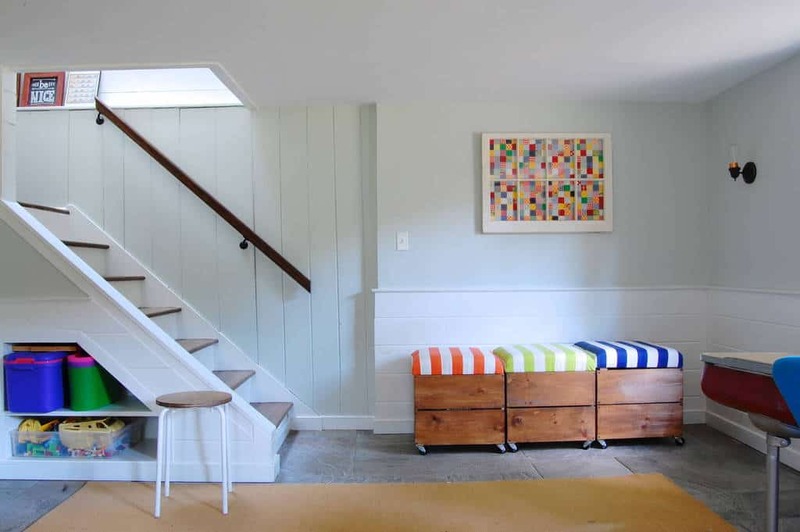 Below, we’ve gathered 32 basement design ideas for to look through. Take a look at all the possibilities. 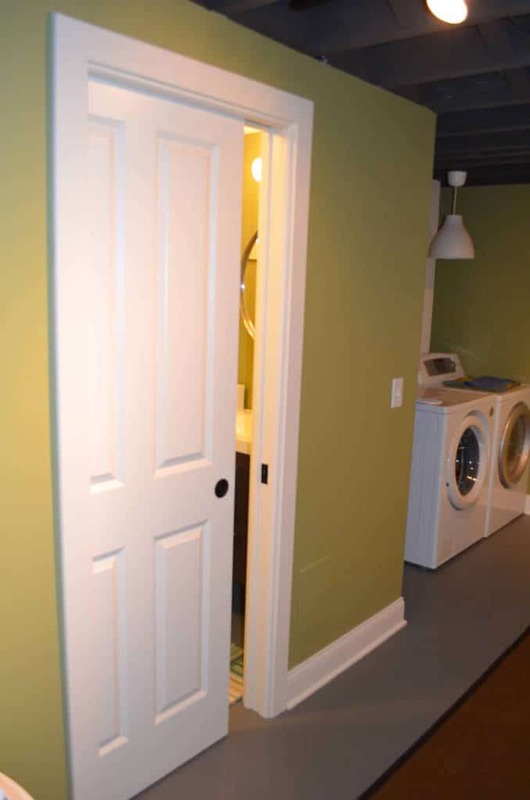 This basement blends colors together well. The light stacked stone design contrasts really well with the darker cabinets. 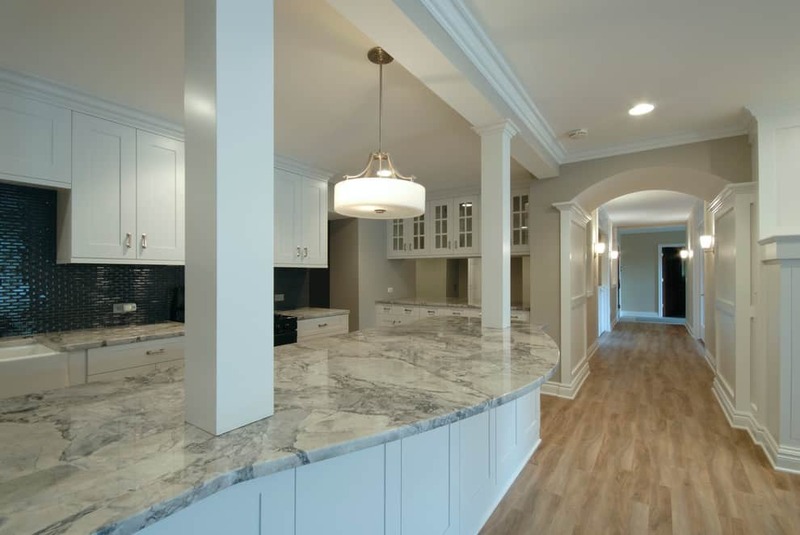 The curvy counter top is a great way to bring character to this traditionally designed room. This basement is ready for all your needs. 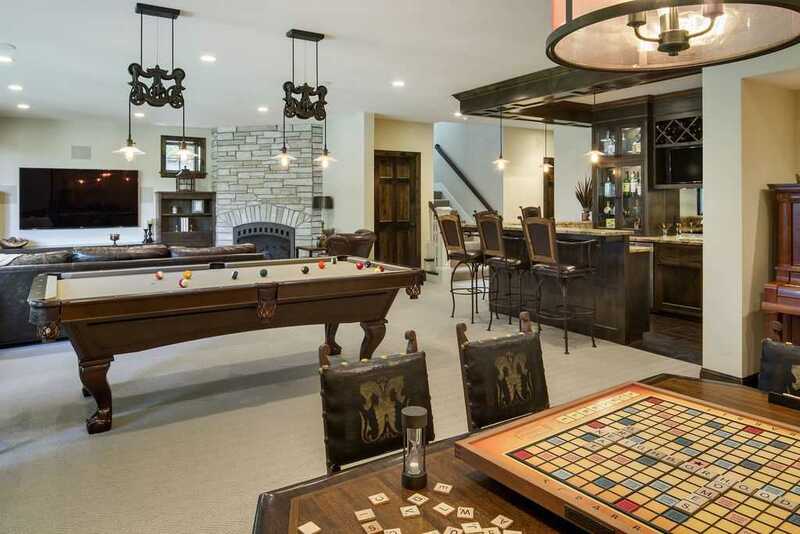 Coming into this basement, you are surrounded by stylish designs. From the hardwood and the stone, to the great decor, this room is great. No matter what you are here to do, you will find a fun space. 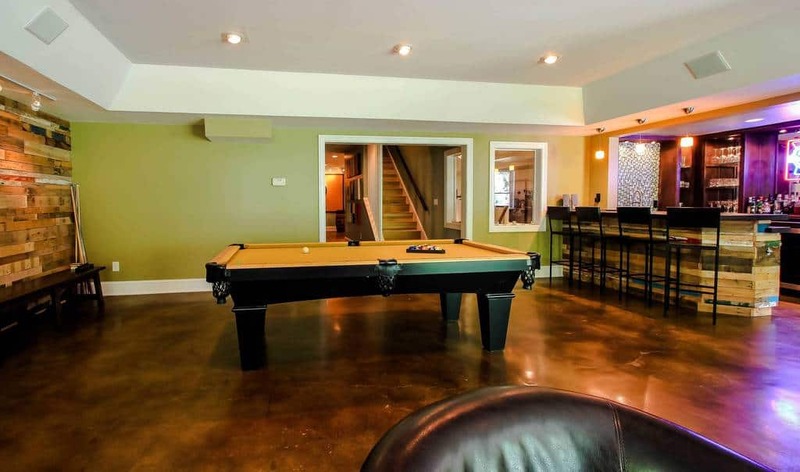 Watch a movie, play some pool, or have a drink at the bar. You can do it all here. 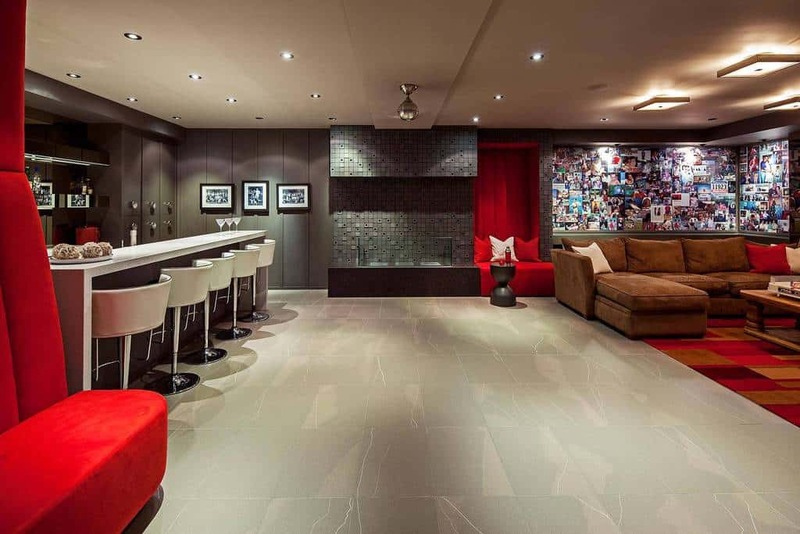 This basement has a great artwork and decor style. It is colorful and brings a great addition to the light hardwood floor and the beams. 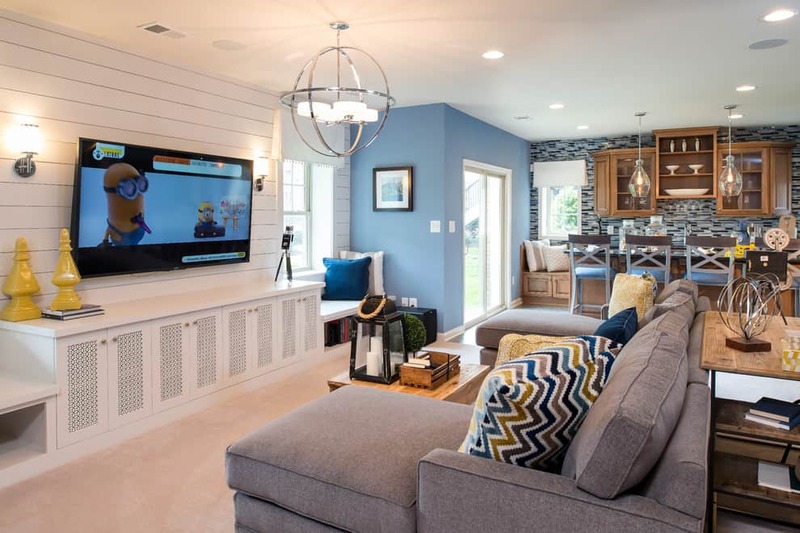 With light blue for the walls to blend with the cream colored carpet and furniture, this space is ready for a movie night. Come play a game of pool here after you finish a meal. 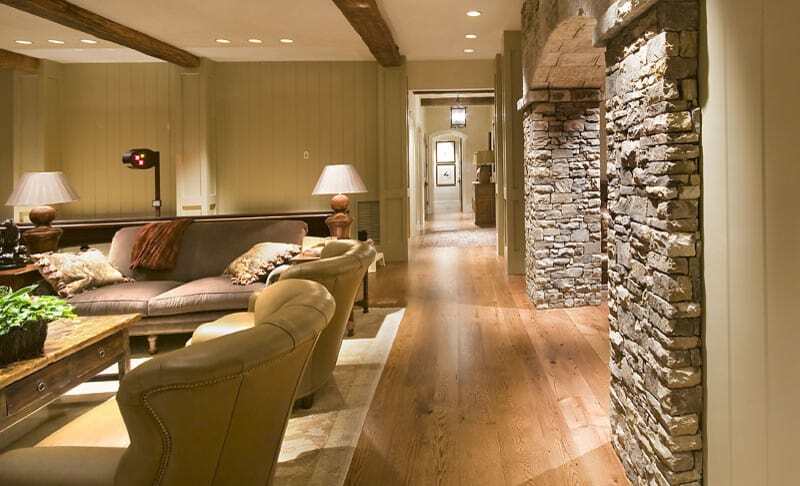 The stacked stone design here blends well with the hardwood used around the room. The open space is ready for whatever you want to put in it. Make it a game room and set up some comfortable couches to watch a movie on. The use of darker colors to blend with the white walls is a good design choice. The contrast creates a welcome environment that lets you relax. When you have a large collection of something you love, you need somewhere to show it off. This shows just how you can do it. 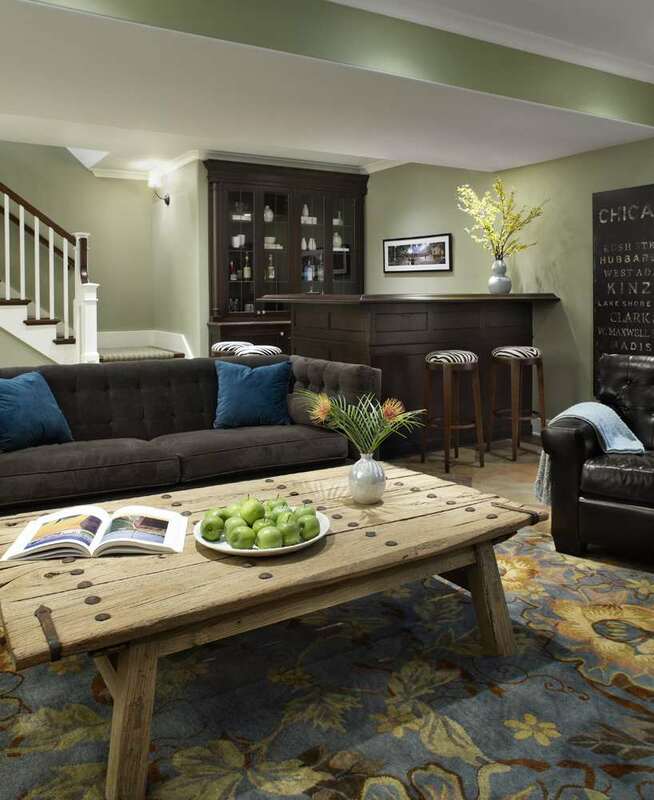 Design the basement around your favorite time period. 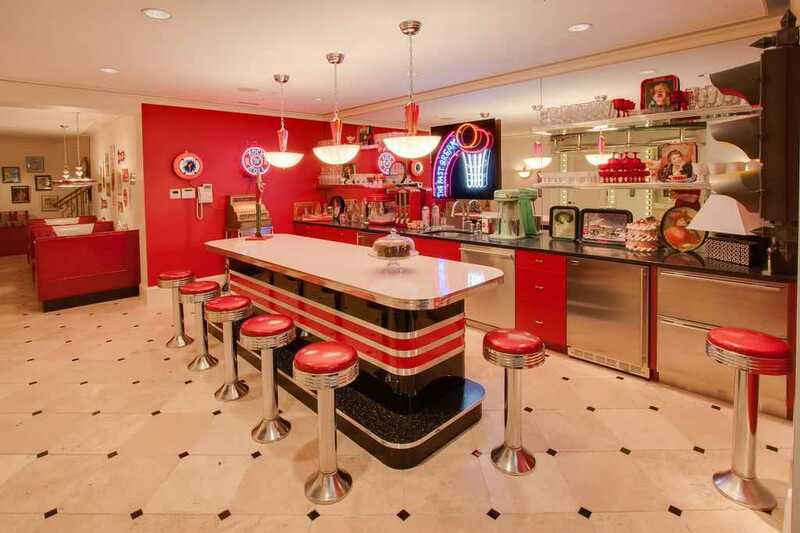 This retro space is like an old diner, straight out of the 60s. 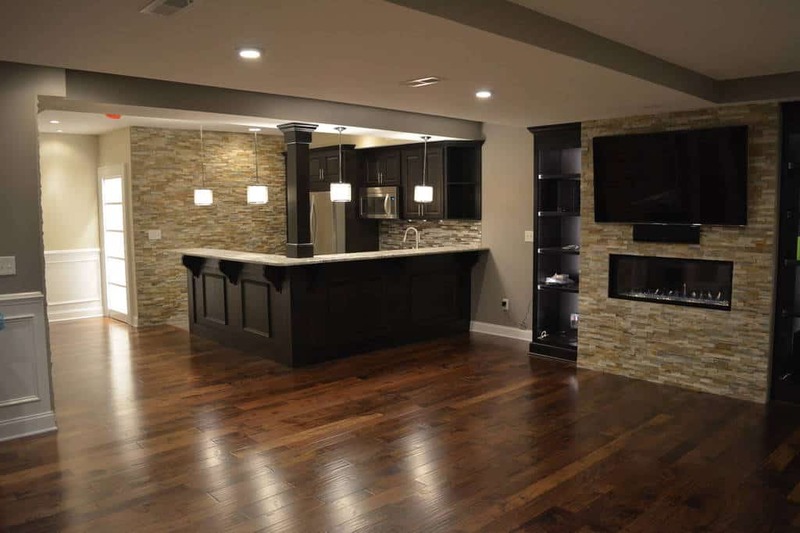 With attractive hardwood and a rustic stacked stone design, this basement has a great and warm design that will welcome you every time. 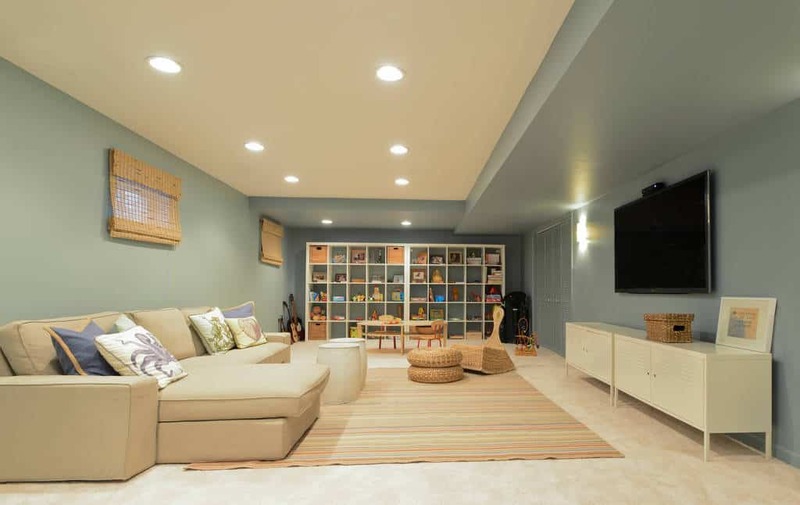 If you have kids and need an extra room for them to play in, the basement makes a perfect space. This room is bright and ready for fun. 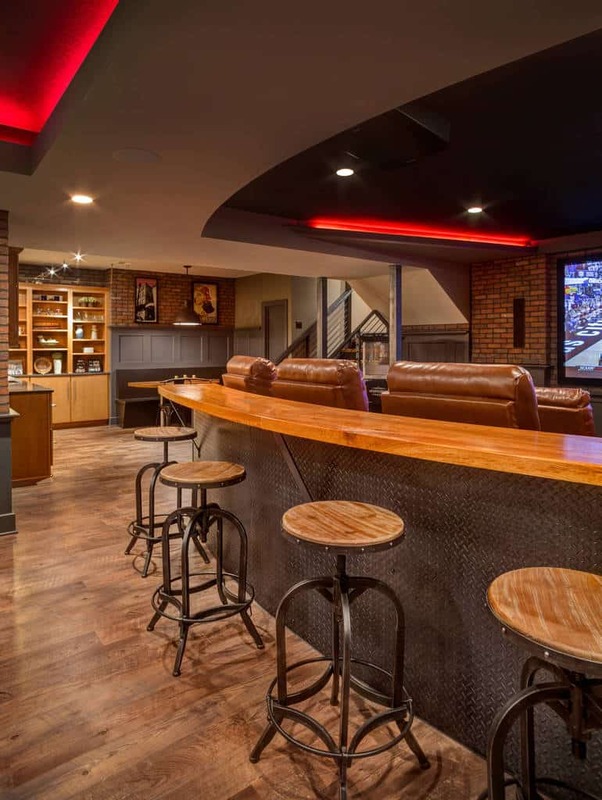 This basement is turned into home theater. With a projector to play your favorite movies, this space is elegantly made up. 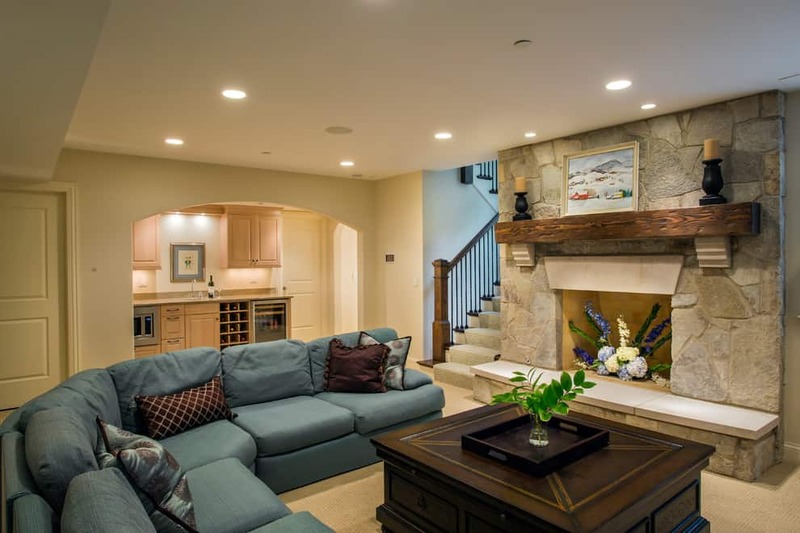 The wrap around sofa is perfect for this basement. 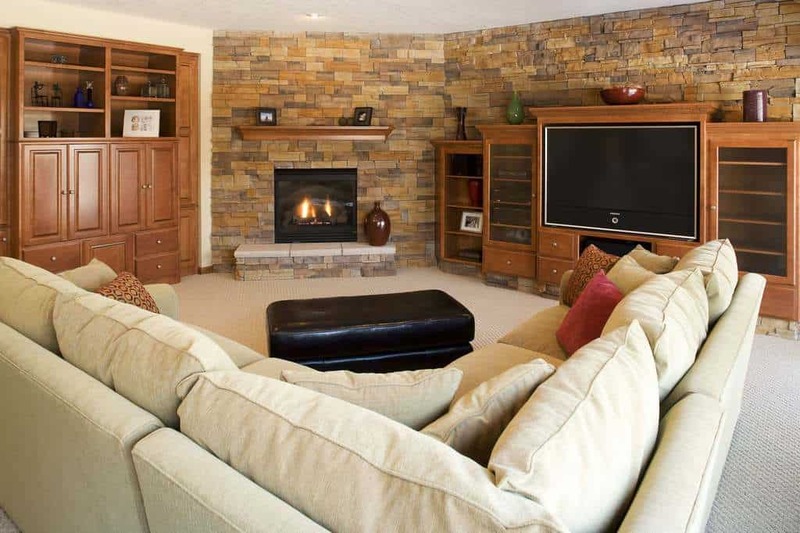 It blends with hardwood and stone fire place area well and give you and your guests a comfortable space to relax. 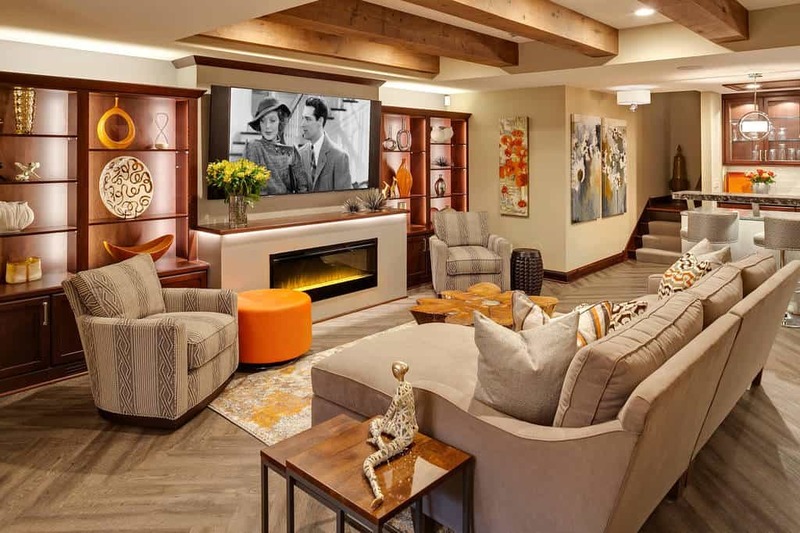 With great artwork and light decor for this basement, you have a space to get away to and watch some movies and shows. 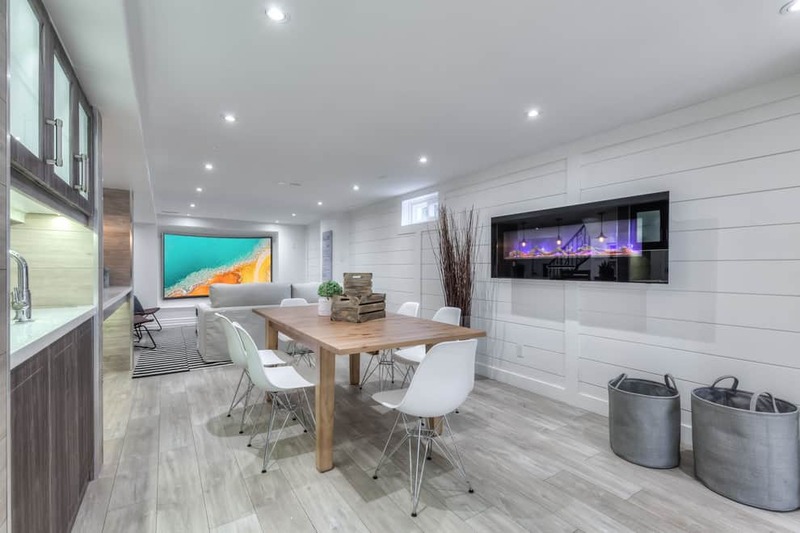 The light hardwood used around this room, from the floor to the walls, brings a vibrant style to this basement. With a space for meals and entertainment, this will be the hangout spot. This room takes on a modern country style and is like a second living room. Come here for relaxation and some time in front of the television. This is a fun room with great style. The rugged designs used in this space, from the bar to the brick walls, bring this room to life. You have great stools to sit on and enjoy a drink, or you can sit on comfortable chairs and catch a game. 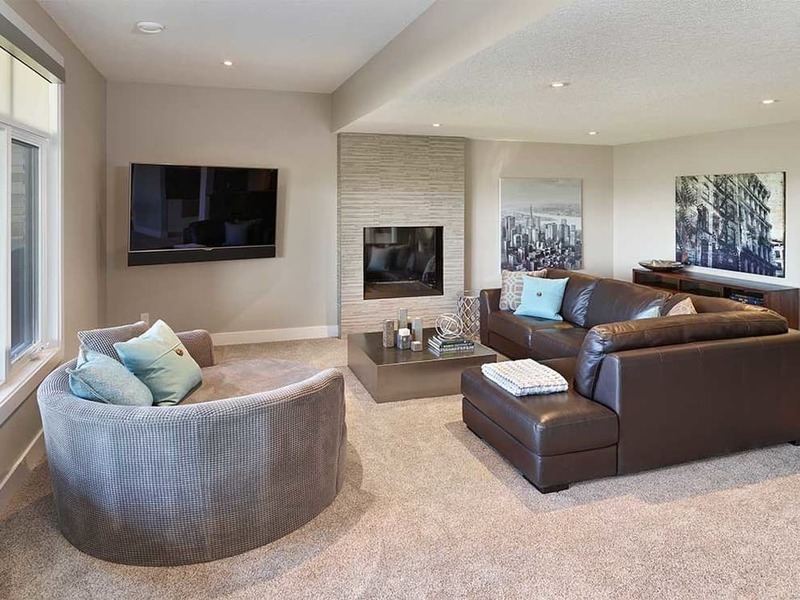 This open and hip space will provide entertainment for your guests. 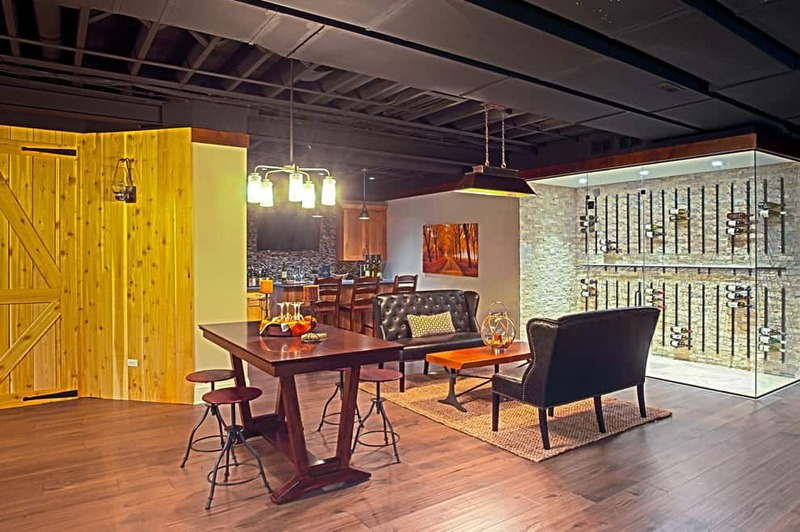 With an area for wine and a space to enjoy it, the spacious floor plan takes an industrial style and makes it work. 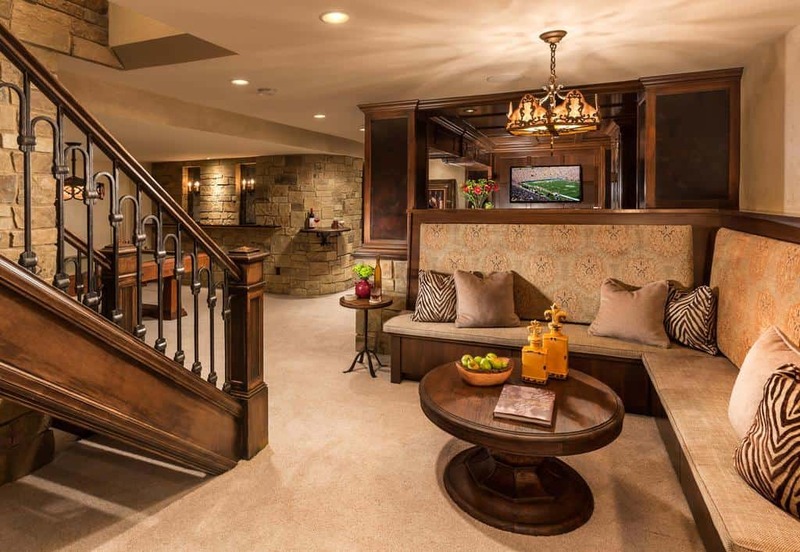 The carpeted stairs lead the way to an elegant basement. With a bar to provide your drinks and space to sit and relax, you will entertain people here often. Sometimes you just need extra space for your laundry and an additional bathroom. 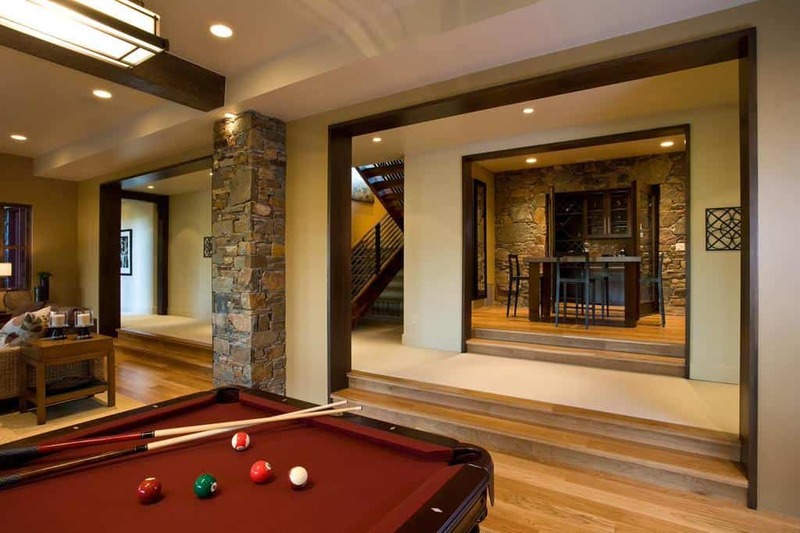 This basement provides both and makes it look great. This is a modern space. Well designed to have an open style and featuring a great blend of colors, this room is boldly ready for you and your guests. With a large space like this, you have room for everyone to be entertained. The kids can wear themselves out and the adults can relax while watching. Keep all of your items ready to go in this space. They will be out of sight and won’t clutter any other area of the house, but will be ready when you need them. The hardwood shelves and cabinets blend perfectly with the brick style used in this space. 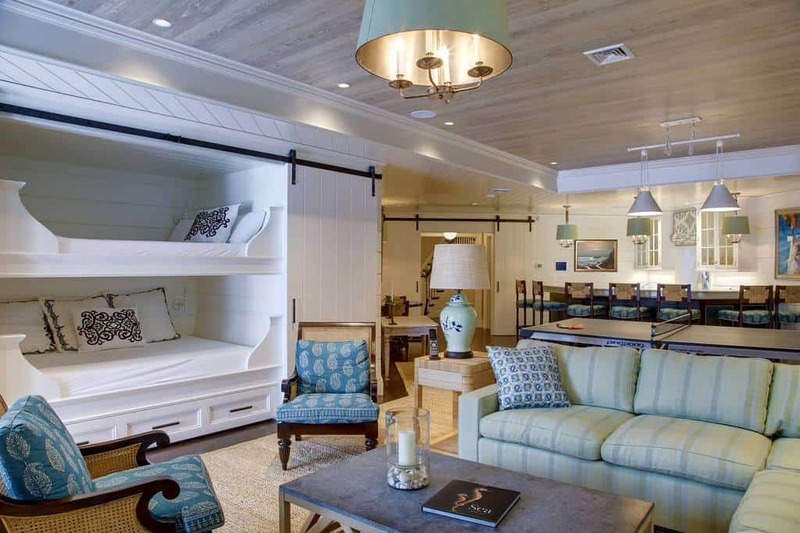 With a wrap around couch, you will have plenty of room to relax. This large window will give you plenty of fresh air in the basement. 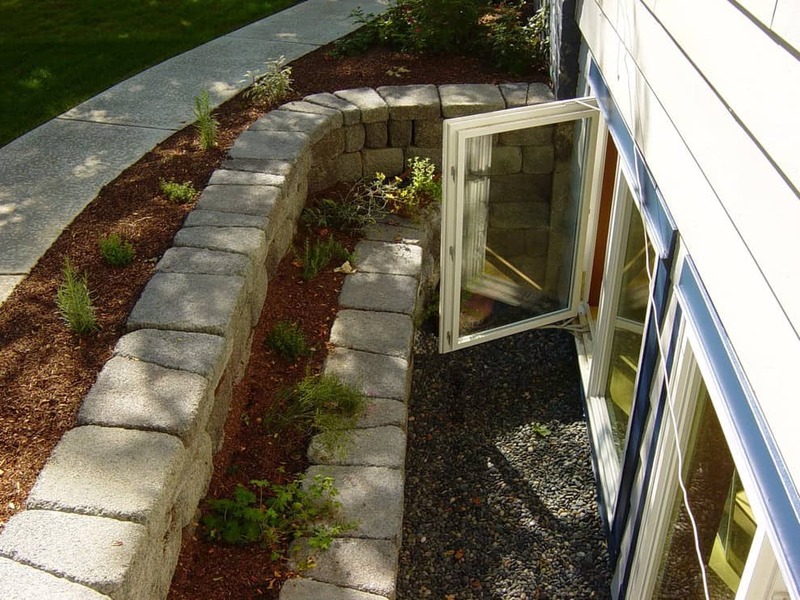 While most basement spaces don’t have this option, this landscaping allows for it. Turn your basement into your creative space. 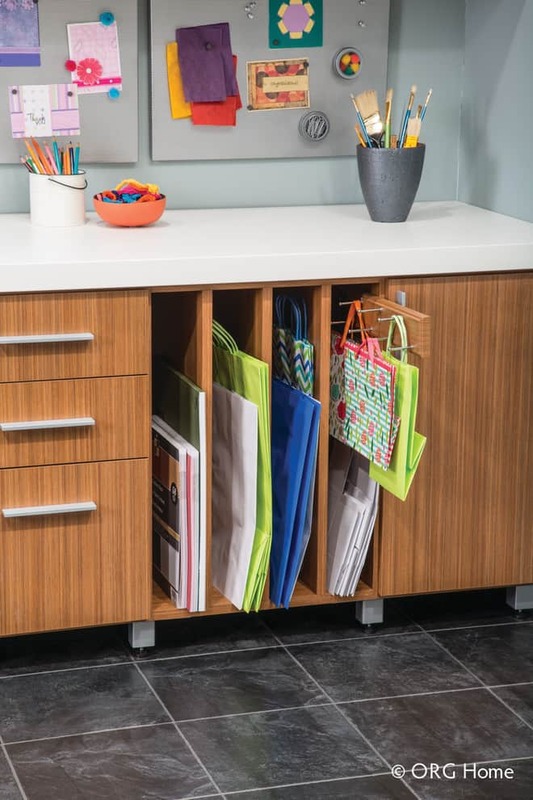 This area will keep your bags and books organized and you can get arty whenever you want. With a rough stacked stone design around the entrance, this space has a great hardwood floor and calm decor. Come here when you need time to unwind and relax. A smooth and bold floor sets the tone of this room. 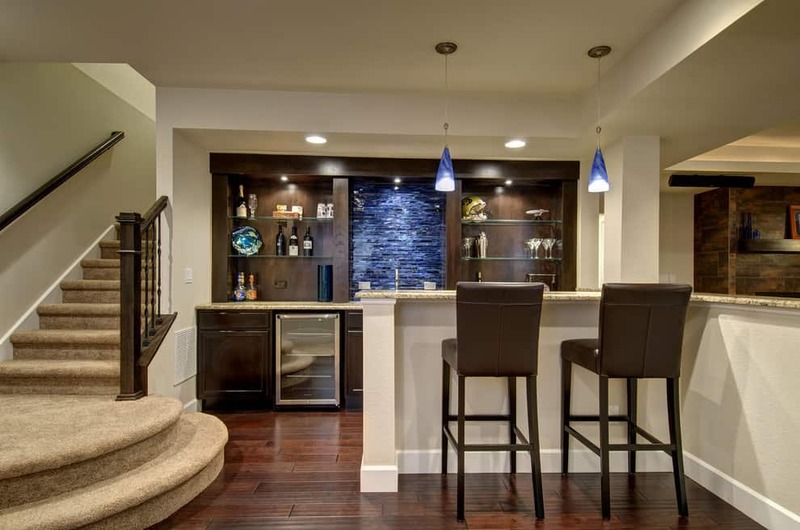 With contemporary lighting and plenty of space to have fun, this will be your area to party. Have a meal, relax with a book, or take a nap. You can do it all in this basement area. With light colors that give this room life, you will always find this space relaxing. With dark hardwood giving this basement a bold style and a fantastic table in the middle of the room, this space is handsome and warm.